There is no escaping the troubles that this world is currently experiencing. So many emotions are evoked. If nothing else, we are being taught over and over again that life is ultimately out of our control. Why did we ever really think that we controlled our destiny? We have some control over the daily choices we make, but even after we have chosen, things can so easily be taken out of our hands. I think a lot more about mortality these days. Getting slightly older really makes you think, parents and other relatives a generation on from us are also causing me to think along these lines, but actually, age isn’t the only factor. Mortality effects everyone no one is exempt and no ones knows when it could happen. Life can change in an instant despite the choices and decisions we’ve made. We can’t control everything that happens to us any more than we can control the weather. All we can do is choose regarding matters in relation to daily life, but even then our plans and choices can be changed dramatically, in an instant, by things we haven’t planned or asked for. In any given situation I can surmise what I would do, how I would act or react but not until I’m faced with a particular scenario will I really know how I will cope or feel. Living each day with my life placed in God’s hands is what brings me the peace I need. I may not know what will happen but He does and I trust him with that. As much as I think I control my life, in reality, God knows my destiny and my eternity, and in regards to eternity I am really the one who makes that choice, the options are in front of me. No one else can determine my eternity, but they can influence it. I can determine eternity by my choice, by my action or my inaction. All these thoughts enable me to live with less fear and worry. The more I know him the more I know that today is inconsequential in the big scheme of things and what will count is eternity. 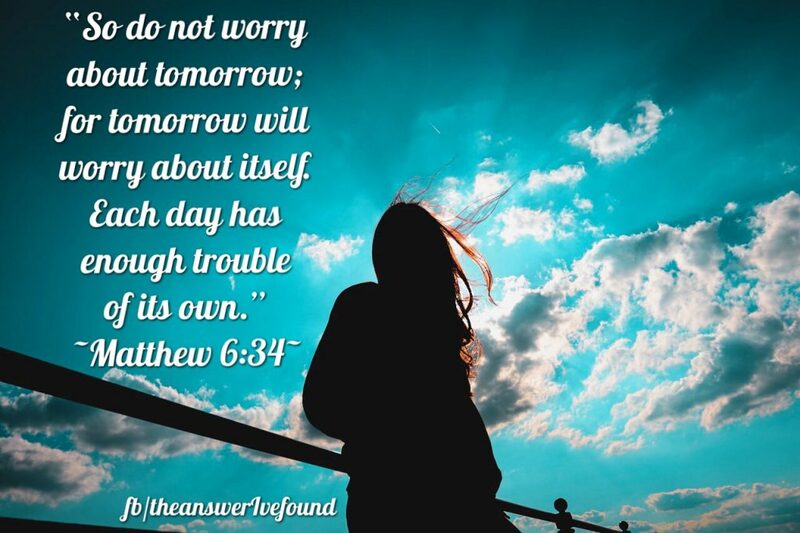 I’ve never thought of all of this before In light of this verse of scripture but it makes sense not to worry when we realize there will always be things out of our control and always be things in His control. Regardless of what’s going to happen, it still will happen. And God will still be God and be faithful. control, destiny, enough, faith, God, life, mortality, tomorrow, worry. Bookmark.